We included in our Standard Course our unique teaching method focussed on oral skills’ improvement. You will study Japanese language like you never did before in your home country and we guarantee you the best results. For efficient oral pratice, this program is for you ! You will take 15 Lessons in one week. Classes are not only taken place in the classrooms, but also out of classrooms to use it.Fron beginner to advanced, you will quickly level up. ※■parts are all included in the fee. 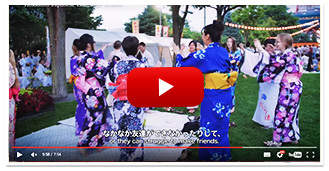 Choose a cultural lesson you are interested in, and join for an additional 5,400 Yen a lesson. You can apply after entrance. Please apply by the day before the lesson.